Dive into the wet, wild world of Six Flags Hurricane Harbor. At this 22-acre waterpark next door to Six Flags Magic Mountain, you'll splish-splash into a world of fun. 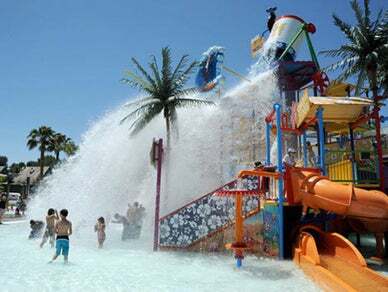 Enjoy two of the tallest fully-enclosed speed slides in Southern California, a 1,300-foot river, a wave pool, an interactive lagoon and a kids' play area.